In the retail industry, visual merchandising color schemes are capable of shaping the mood of consumers. According to research findings, this disposition state of mind determines if shoppers spend more or less in retail outlets. Big retail chains are wary of this retail psychology. Their marketing strategists work hard to transform customers into a purchasing mood. These experts employ all available strategies to achieve this goal. Some of the methods in retail psychology include the use of visual merchandising color schemes in stores. What should be the predominant shades? Is there an overall color that shoppers discern while entering your shop? Scientific research studies specify colors stimulate the human nervous system and affect a person’s feelings or emotional state. Effects of colors vary according to race and culture. Among Americans, fusion of certain shades like green and red are linked to the holiday season. 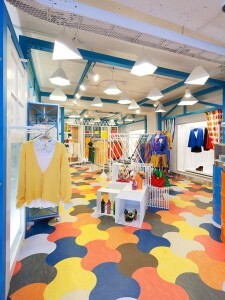 In retail design, colors are utilized to generate different brand images. These have significance to customers such as white (cleanliness or purity); red (excitement and craze); black (power and high fashion); yellow (joy and friendliness); purple (dignity, royalty and upscale); and blue (relaxing, comforting and serenity). Thus, it is really important for retail marketers to make use of the appropriate colors for their stores and displays. Effective retail design stages the store’s physical space to increase sales. Customers are more prone to purchase if they like your space and find things they are looking for. Space strengthens brand characteristics. Smart retailers must be able to integrate visual merchandising color schemes and other relevant elements to build brand stability. Music also helps establish the right disposition for consumers. This is a must-know in retail psychology. Another retail study revealed that most customers spend around 30 percent longer in establishments such as department stores and supermarkets if beautiful background music is played. However, it cannot be determined what type of music can really increase sales. The bottom line is the mood should be jovial which contributes to a more pleasant shopping experience and make the merchandise look more attractive. Pride can be another factor although some retailers believe it really does not develop desire for household merchandise. On the other hand, emotion of gratification encourages consumers to yearn for home products. Consumers will likely purchase items depending on their feelings. Upbeat moods can increase the possibility that human beings will exhibit attitudes that have positive results. In the same manner, these reduce the possibility persons will display behaviors with anticipated negative consequences. Happy or satisfied consumers will most likely buy from a store compared to those who are discontented. As part of retail psychology, store operations and their managers must find out ways of putting their shoppers in a cheerful frame of mind. A potent but simple strategy is to put on a very nice smile and charming personality. Store staff must be trained to grasp and adopt this outlook. There are also various visual tricks in retail that enterprising retailers need to learn about. It is advisable to change merchandising displays every month to prevent them from getting outmoded. Likewise, exchange displays at least two weeks following their arrival. You can transfer displays from the frontage to the center of the shop or from the middle to the rear. Adopt variation to support your design themes. This will prevent dullness of displays and decors. There is nothing wrong to use the same themes annually but refrain from utilizing the same style. Conceive a new appearance so your shoppers will not get bored. One of the visual tricks in retail is to use schemes as sub-themes. It is not advisable to use the same for various themes repeatedly. Simply store these materials and use them again after several months or install them in other branches or locations. Other visual tricks in retail include applying the different design principles and components. These elements are forms, shapes, lines, spaces, colors, measurements, textures, and values. On the other hand, the principles include unity, balance, harmony, proportion, contrast, pattern, rhythm, emphasis, and uniqueness. The design concept statement is essential with respect to multiple design situations. The statement must be compelling for designers to remain competitive. Design concept statements are meant to impart unmistakably the designer’s strategy for a space to clients or specific audience. Declarations such as this must address the designer’s accomplishments or plans to create a particular sentiment like style, openness or vigor. At times, the statement may be an element of a presentation with illustrations or visual images of said space. Retailers need to keep their establishment’s physical appearance clean at all times. Allot enough resources to maintain the façade along with the external appearance of their stores. The good looks of the store should cover sign posts, banners, exhibition areas, awnings, landscape, and store entrance. Use significant visual merchandising color schemes or distinct moldings to set apart your shop from competitors. Even the shelves, racks and showcases together with Point of Sale materials must be maintained. Implement repairs immediately if certain parts are damaged. Repaint old ceilings and walls. Take away old advertisements and tattered streamers. Wash carpets and fabrics to ensure a fresh look all the time. Visual merchandising must not be limited to displays or products. It should cover include necessities to get customers’ attention from the store’s façade all the way to merchandise on the shelves. Arouse the senses of people to obtain their interest. The key is to provide consumers with a remarkable shopping experience to bring them back to the establishment. In doing this, retailers are assured of sustained revenues and success.